Digital World Biology (DWB) has released three new kinds of card decks that can be used to play multiple kinds of games. All three were inspired by the essential units of proteins: the amino acids. Amino Fish™ and Amino Fish Pro™ are based on the classic Go Fish! card game where the goal is to make sets of matching cards and be the first to get all of your cards into sets. These games are designed to help students learn their amino acids. 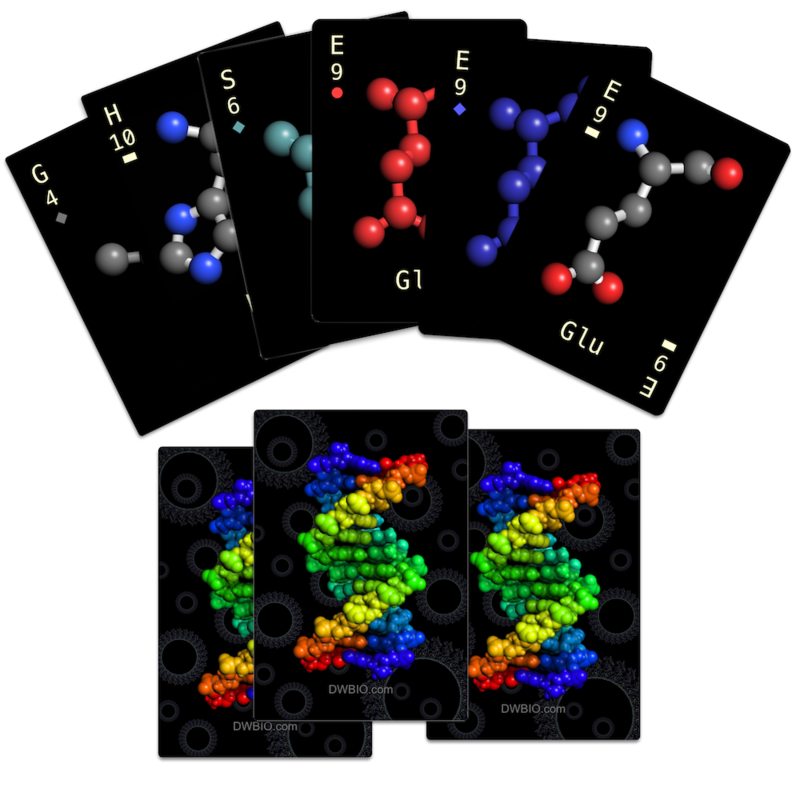 Each deck has 60 cards and each of the twenty amino acids is represented in three coloring modes: element, charge, and hydrophobicity. The coloring modes match those in Molecule World, DWB’s 3D molecular structure viewer. Amino Fish has both the single letter amino acid codes and the full amino acid names on the cards. Amino Fish Pro, has only the single letter codes. When you play the game, you have to ask for the amino acids by name. This helps with learning the names and recognizing the structures. Amino Rummy™ is a new kind of card deck. Like Amino Fish it has 60 cards with each of the twenty amino acids represented in three modes: element, charge, and hydrophobicity. We call these suits: bars (element), circles (charge), and diamonds (hydrophobicity). For those who don’t know their amino acids, it’s simple, there are three suits and 20 cards per suit; each of the 20 cards has a letter. But there is more. To play games like Amino Rummy, Amino Gin Rummy™, Amino Cribbage™, Amino War™, Crazy Charges™, and many others we need some numbers too. Since amino acids are made up of atoms we can count the atoms in each amino acid. We put these numbers on the cards, too. Now, each card has a letter, a suit, and a number. The twenty amino acids in the deck gives us a full range of numbers from four to 12, and 14. Just like the floors in a hotel, there is no 13. As the title mentions, Amino Rummy has a biological twist. The essence of biology is based on probabilities and distributions. Many have heard of a bell curve. Amino Rummy has its own bell curve, but with numbers. That is, the numbers, 4-12, and 14, occur at different frequencies. To learn the distribution you have to count the cards. With letters, suits, and numbers we can make matches, straights, and points to play our favorite card games. Because cards have different colors and representations of amino acids, we can assign wild cards and trump cards too. We’re just at the beginning of learning what kinds of games are possible and we hope others will make games and share their rules. Most importantly, we’re learning that DWB’s Amino Card games are fun. In biology or chemistry classes these will help students learn the basics and understand a variety of concepts. Math classes should enjoy computing odds for various hands. Most importantly, you do not need to know any biology or chemistry to start, but you might learn some while you play, and that is fun too. The cards are available at the Digital World Biology shop on Etsy.